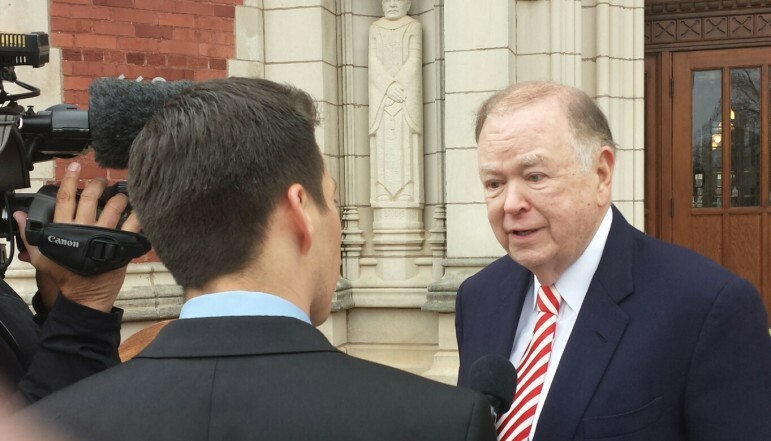 University of Oklahoma President David Boren, shown here during a press conference earlier this year, is calling for a statewide penny sales tax for education. A proposed penny sales tax increase would cost medium-income Oklahomans about $262 a year and raise $608 million annually to finance public schools and higher education, a new data analysis shows. The bottom 20 percent of Oklahoman households would chip in $90 a year, and the top 1 percent would pay $1,691, the study says. As a percentage of income, though, the tax would fall hardest on the poor. That’s because they spend a bigger portion of their income on retail purchases. The analysis was prepared in recent days by the Institute on Taxation and Economic Policy, a nonpartisan research organization based in Washington, D.C. It was requested by the Oklahoma Policy Institute, a Tulsa-based group that supports higher levels of funding for education and other core state services. The analysis was done in response to a proposal floated last week by University of Oklahoma President David Boren. A former governor and U.S. senator, Boren announced he was organizing an effort to put a penny sales tax proposal on the November 2016 general-election ballot to boost funding for education. Boren declined through a spokesman to comment on his tax proposal, saying it was “premature” to discuss it until he consulted with other state leaders. David Blatt, executive director of the Oklahoma Policy Institute, said the data analysis shows that lower-income Oklahomans would pay a disproportionately large share of a penny sales tax hike, while higher-income taxpayers would pay more in dollar terms. The analysis appears to be the first of its kind since Boren announced his penny tax campaign. Officials at the Oklahoma Tax Commission and Oklahoma Office of Management and Enterprise Services said they had not prepared a similar study. The Institute on Taxation and Economic Policy study analyzed the impact of a penny sales tax increase by income groups, from the bottom 20 percent through the top 1 percent. > People in the lowest quintile, with an average household income of $12,700 per year, would pay an additional $90 annually if voters approved Boren’s plan. That’s 0.7 percent of their annual income. > People in the middle tier of taxpayers, with average income of $49,800, would pay an additional $262 a year at the checkout stand. That’s 0.5 percent of their income. > People in the top 1 percent, with average yearly income of $1.6 million, would pay $1,691 in additional sales taxes, or 0.1 percent of their income. The state’s existing 4.5-cent sales tax raised $2.4 billion during the most recent fiscal year. The state’s use tax, also 4.5 cents, raised $259 million. The use tax applies mainly to Oklahomans’ purchases of materials in other states or online. Oklahoma cities, towns and counties also collect sales taxes. They vary by location, from as little as 0.25 percent in Cedar Valley to as much as 4.662 percent in Glencoe. Municipal sales tax collections totaled $1.7 billion last year, and county sales taxes brought in $376 million. Boren did not provide specific details of the proposed initiative petition. It was not immediately clear whether he intended it to be a statutory change or a constitutional change. A statutory change would require far fewer petition signatures. In either case, the state Legislature and governor would not be directly involved in the process. Penny tax backers would file petition language with the Secretary of State and Attorney General. If the language is approved, they would have 90 days to collect signatures: 65,987 for a statutory change, 123,725 for a constitutional amendment. If they succeed, the measure would appear on the November 2016 ballot. In an email sent to prospective steering committee members, Boren said he thought it was critical to find a new source of funding for common schools, colleges, universities and vocational-technical schools. He cited teacher shortages, low salaries, declining state appropriations and rising tuition as evidence. Boren predicted that the state would be facing a budget shortfall next year of “almost $1 billion.” This year’s shortfall was $611 million. State officials have not yet estimated the size of next year’s shortfall but have warned that it would be substantial. The State Equalization Board will issue the first official estimate in mid-December. Retired Oklahoma State University economics professor Larkin Warner said a sales tax hike would be “highly regressive,” meaning high-income people pay a smaller percentage of their income. But it still might be the only politically feasible way to increase education funding. He said he probably would sign the initiative petition, grudgingly. Penny sales taxes earmarked for education, similar to a proposal in the works in Oklahoma Thursday, are nothing new and have seen mixed results across the nation.